At San Gabriel Valley Medical Center, we're all about Our Family Caring for Yours. Our approach to care is simple: We treat our patients in the way we want our loved ones to be treated – with compassion and respect. This philosophy has guided the employees and physicians of San Gabriel Valley Medical Center since our opening over 50 years ago. Our team of healthcare professionals is dedicated to promoting and championing the individual needs of each patient and family in a caring and supportive environment. We utilize a holistic approach to provide comfort and healing for both patient and family in a culturally sensitive manner. 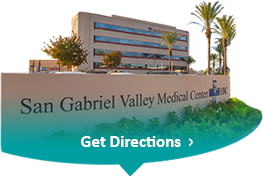 At San Gabriel Valley Medical Center, you and your loved ones can be confident in the care provided by over 500 physicians and 1,000 employees who utilize advanced technology to diagnose and treat thousands of patients each year. Emergency Care: Available 24/7 whenever you need us. We treat over 24,000 people each year from minor illnesses and injuries to serious life-threatening conditions. Surgical Services: Both inpatient and outpatient surgeries are performed in our state-of-the-art Surgery Department. We specialize in a wide range of surgical services including Orthopaedics and Spine, Gynecology, Ophthalmology, ENT, and many more. Newborn Intensive Care: If an infant requires specialized care, our NICU staff has the expertise to help. Sub-Acute: For patients needing long term care due to chronic respiratory and other conditions, the Sub-Acute Unit provides supportive care for both patient and family. Geriatric Behavioral Medicine: Our inpatient center treats seniors experiencing mental health issues in a comfortable, safe environment. Diagnostic Imaging: We offer a wide array of diagnostic imaging services and have one of the few 128-slice CT scans in the area. The hospital opened its doors in 1960 as a 146-bed facility called the Community Hospital of San Gabriel. In the mid 1980's, the hospital's name was changed to San Gabriel Valley Medical Center (SGVMC) to reflect a significant expansion in bed capacity and breadth of services offered. Over the years, the hospital has continued to expand its services to meet the needs of the residents of the San Gabriel Valley and beyond. Today, our now 273-bed hospital is considered one of the premier healthcare facilities in the San Gabriel Valley. SGVMC is a proud affiliate of AHMC Healthcare Inc.